Run by volunteers NPTCC is a local charity that helps local people. Our aim is to help with the prevention, early diagnosis and treatment of all types of cancer. We raise funds to purchase equipment for local hospitals in Neath Port Talbot, Singleton, Morriston and Bridgend. A Management Committee comprised entirely of volunteers administers the Charity, and fixed overheads are minimal. The Charity does not pay any salaries, wages or honoraria, and has no assets that incur maintenance costs, thus maximizing the funds available to meet its objectives. Since its beginnings NPTCC has raised over £750,000 to purchase vitally needed equipment in the local area. Each request for help is different so we consult with the hospitals to find out what is needed, a target is then set, and when we have the funds in place a purchase is made. The equipment is then presented to the hospital. 2017 is the 20th anniversary of the charity's formation. We will be marking this with a series of events throughout the next 12 months. The celebrations started with with a Cymanfa Ganu on 12th October 2017 which was enjoyed by a large audience. 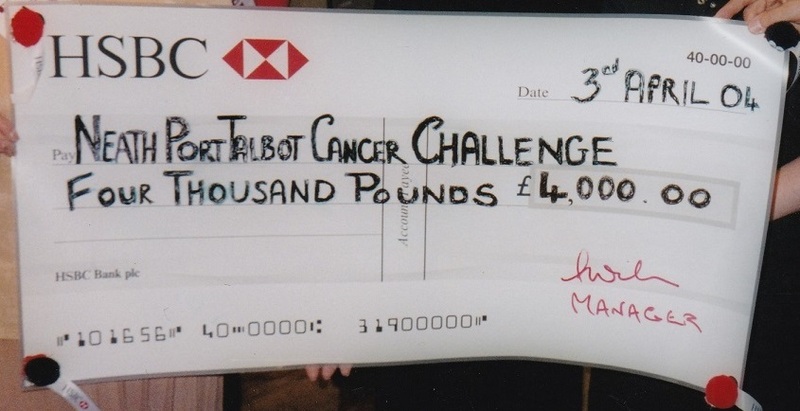 In 2006 Neath Port Talbot Cancer Challenge was presented with the Queens Award, the highest award given to local volunteer groups across the UK, to recognise outstanding work done in their own communities. It was created in 2002 to celebrate the anniversary of the Queen's coronation. It is the MBE for volunteer groups across the UK, to recognise outstanding work done in their own communities. It was created in 2002 to celebrate the anniversary of the Queen's coronation. It is the MBE for volunteer groups. The Charity has organised a coffee morning to take place at the Aberavon Beach Hotel at 10am on the 29th April. Tickets cost £3.50. We are very pleased that Mr. Ghattaura, a surgeon from Swansea Bay University Health Board, has kindly agreed to be our guest speaker for this event. Mr. Ghattaura will describe how he and his colleagues use the new microscope that was recently purchased by the Charity. 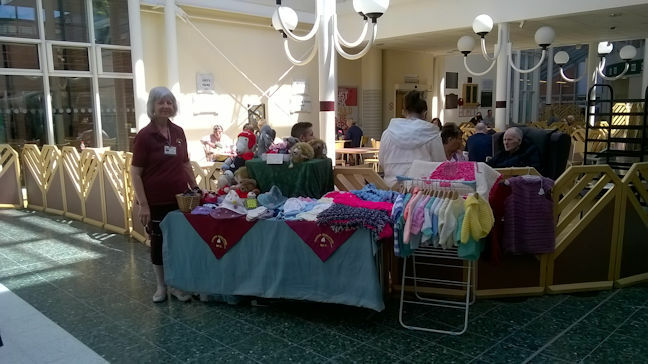 Charity volunteers will be at the atrium at Neath Port Talbot Hospital on the following dates during 2019. Please pay us a visit and help us to raise money for the charity. 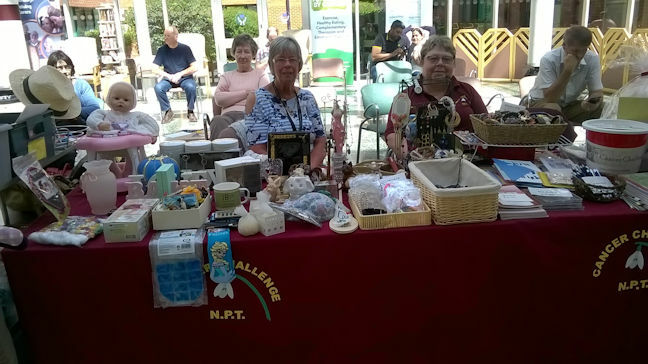 Audrey Ranford and Pauline Willment are pictured behind our bric-a-brac/charity table and Pamela Young is pictured by the craft table. The Neath Port Talbot Cancer Challenge Choir presented a cheque for £3,000 to the Charity at its annual concert held at St. David's Church, Neath in September 2018. We are very grateful to our friends in the choir for their continued support of our fund raising activities. Members of the Charity Committee travelled to the Palace of Westminster in London on 29th October to meet local Aberavon MP Stephen Kinnock, Gower MP Tonia Antoniazzi and former Neath MP Lord Peter Hain. Visit our Events Page to see photographs and a link to the letter of welcome written by Stephen Kinnock. The charity concert held at St. David's Church, Neath, on 2nd July was a great success. The concert featured soprano Rebecca Evans with the Neath Port Talbot Cancer Challenge Singers. The committee is very pleased to announce that the profit of £3250 has enabled the charity to meet its goal of raising over £100,000 for the purchase of a piece of equipment to be used at Neath Port Talbot Hospital to treat those suffering from lymphoedema. The charity's sister organisation, the Neath Port Talbot Cancer Challenge Singers, visited Taunton on 4th May where they performed a concert at King's College. They shared the stage with guest soprano Emma Edwards and the King's College Chamber Choir. All proceeds from the event were donated to the charity and we are delighted that the sum of £380 was raised. 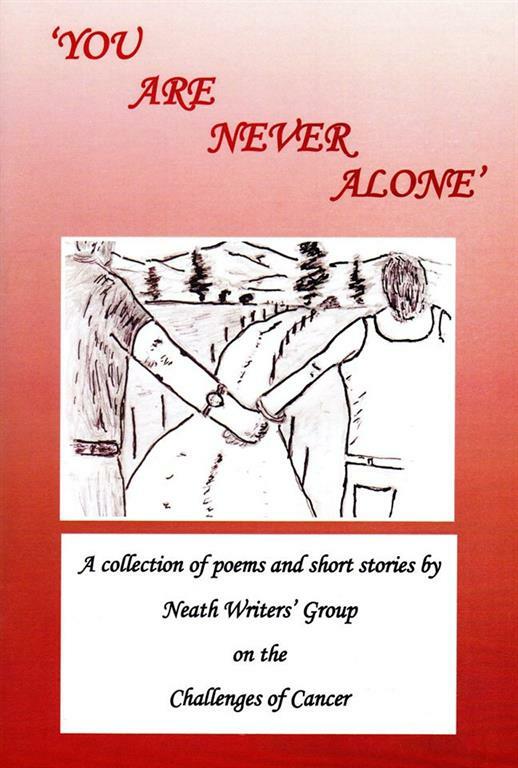 Neath Writer's Group has produced a book of poems and short stories, entitled "You Are Never Alone", about the challenges of living with cancer. Copies can be purchased for £5 from Neath Library with all proceeds being donated to the charity.